Recently I got a new work laptop with Windows 7 and Microsoft Office Professional 2010 installed. 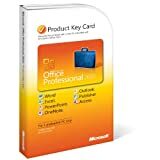 Along with the laptop I got a Product Key Card for MS Office Professional 2010 to activate the license. I am old enough to remember the days MS Office was sold in larger boxes on CDs and DVDs. What happened? I slid out the plastic inner case and opened it to find a card with the product key printed on it. I entered this into the setup screen on my new laptop and MS Office (already pre-installed) was activated right away. Then I noticed that inside the cover of the slightly slimmer box, Microsoft has taken liberty to print some waffle about the environment – perhaps to infer this is the reason for no longer supplying a disc and using less packaging. “Of course! What a great idea to reduce packaging! What’s your problem?” I hear you cry. Well, simply this… why have such bulky unecessary packaging at all? One product key, 25 numbers – and this requires a pamphlet size card inside a plastic box, inside a cardboard box?! Surely, if they were concerned about the environment they could just ship these keys on credit cards? They’d also save a fortune in shipping fees. In fact, why bother shipping credit cards at all – why not just have customers log into your website, make a payment and download the software direct? Microsoft Office Professional Edition 2010 costs ~$300, that’s ~£300 when you convert the dollar amount (US products are on a 1:1 currency conversion with the UK – think I’m joking – google it). OpenOffice.org, or it’s successor LibreOffice, on the other hand is free. You just go to the website and download it for free. So are a number of other office productivity suites such as Lotus Symphony and Google Docs. Imagine if you could simply log into an app store and download Office and had to pay a whopping £300 for it? Maybe some would pay, many would pirate as they do now, and maybe some would go to one of the free alternatives. After a while, the free alternatives would probably become a lot more attractive and popular. But this is not the case with MS Office, or rather it is the case because when you pay £300 for MS Office, you get a case. Not a credit card, not a piece of paper with 25 numbers on it, not web access to download an app – a case. It’s a pretty case too, it looks nice and expensive. It reminds you how expensive it is with the aid of some nice graphics on the back. It makes you feel like you actually bought and own something – not that you downloaded it – even though you did (unless they were nice enough to pre-install). How much do you think Microsoft Office, the app suite, is really worth? £150? £100? £50?… £20? Subtract that from £300 and you have the price you paid to own a pretty box. And if you think I’m talking rubbish, just consider you’d pay upwards of £15 for CD with just 10 songs (only 2 of which you liked) only 10 years ago. Ditching CD boxes, separating tracks and online distribution changed all this. I recently finished reading The Pirate’s Dilemma: How Hackers, Punk Capitalists, Graffiti Millionaires and Other Youth Movements are Remixing Our Culture and Changing Our World by Matt Mason. I posted a link to Amazon to buy the book but it’s free to download (you choose the price) from the Official website. I’ll start by saying that this is a great well-researched book for anyone who is (a) a pirate (b) a creator (c) a media exec or (d) wanting to look at the history and origins of piracy in context. Mason starts off from the odd perspective of introducing us to the punk revolution. The entire first chapter is devoted to punk capitalism. Whilst I think this has it’s place in the history of piracy, I didn’t think it was necessary to devote a whole chapter. I did at one point wonder if I was about to settle into a book which was using piracy as a subterfuge for writing about the history of the music industry, but by chapter 2 we dive right into the heart of the matter, with pirate radio and patent trolling. Nice to see the Principality of Sealand get a mention too. So we can thank Mason for the brief history of punk and forgive him for confusingly making it the premise of the subject of the book. The other niggle I have is the use of the apostrophe in the title. Surely it’s not a pirate’s dilemma at all, but a pirates dilemma – since the dilemma is with the media industry? There is a lot of references to history and the use of copyright, which made informative and educational reading. I had heard before of how early America basically stole works from Europe but I was not informed of the whole story, or of the origins of the contemptuous nickname ‘yankee’! In summary, America was historically a nation of pirates, Hollywood in particular founded on piracy – They were the original Pirate Bay of the 19th century. Don’t take my word for it – read the book! The book pretty much covers all the topics around copyright and piracy, and answers many questions that the less informed may have. Mason frames the act of piracy in terms of culture and history very well – making a compelling argument for not only why we should allow piracy, but support it. The subjects range from graffiti art and other counter-culture movements to the foundation of hip hop and the invention of the iPod. Mason sticks to his music reporter roots throughout and provides insight into his own background in pirate radio and the discovery of Grime. However, despite my issue with the way the book started, he actually does a good job of making the connections of the roots of music with the remix culture, cultural revolution and of course, what is now termed piracy. It’s not all a one-sided argument either. Of course, given Masons background he could be considered biased toward piracy but he actually offers up both the good with the bad – drug dealing and happy slapping are just a couple of examples. With regards to happy slapping, Mason considers this a kind of ‘last resort’ for a younger generation. A generation desperate to get away from a media and marketing culture that ‘pounces’ on any grass roots youth culture movement before it has a chance to become established. Mason references parkour as a strong example of this. Though I don’t think something like happy slapping can be so easily excused, it has given me a new perspective and I’m finding myself agreeing with this view. The Pirate’s Dilemma is not a roadmap to a better future, in fact the logic would seem to indicate we are in a constant war between creative freedom on one side and powerful corporate interests on the other. However perhaps if enough of the right people were to read it – politicians, media execs, content creators, then perhaps there is hope for a more open future society. Already Spain is showing itself to be a much more progressive country in this respect. Could this truth spread to the rest of the Western world some day? I hope so.